We recently hosted a field trip for local Girls Who Code clubs at our office in Hoboken, NJ. 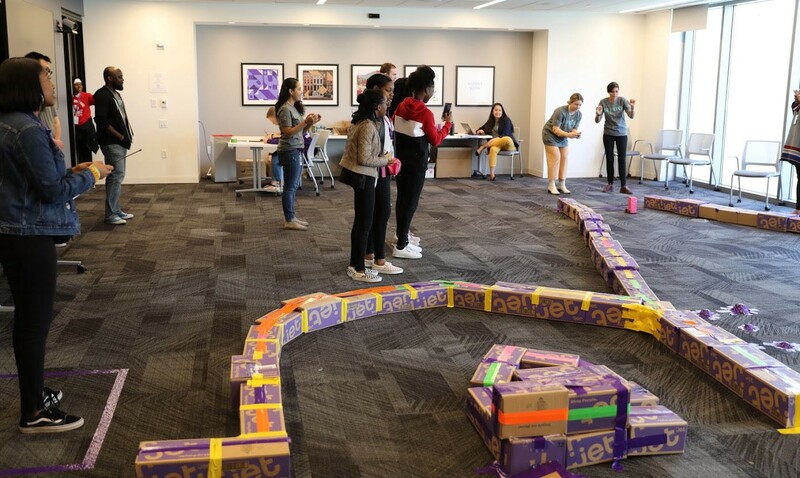 Part of the trip was a STEM activity that empowered the girls to make business decisions that mirror the real-life challenges our engineers work on here at Jet and Walmart. As a man working in Tech, I am all too aware of the gender gap in many STEM fields, especially in the domain of cybersecurity. Closing the gender gap and increasing diversity not only improves equity in the workplace, but it also ensures that products and services reflect the wide gamut of customers we serve. My wife is a successful, Ph.D.-wielding scientist and often participates in STEM mentoring initiatives for high school girls. 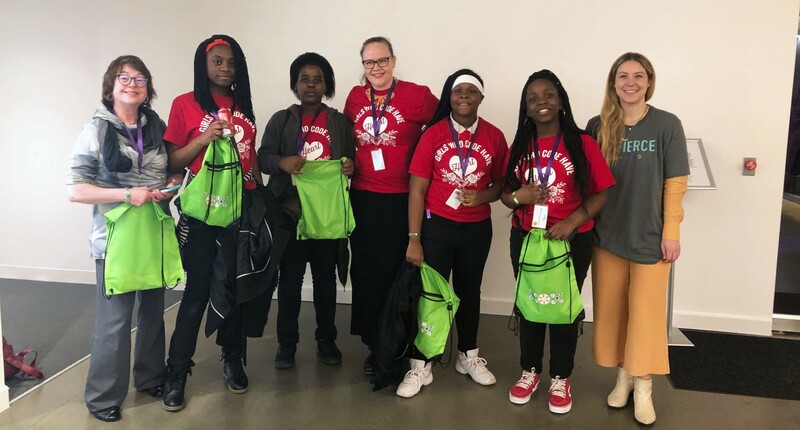 When I heard we were hosting a Girls Who Code (GWC) event here at Jet, I knew I wanted to help and do my part to level out the scales. It’s important for men to directly encourage the next generation of women to invest in a STEM education. In order to shift the balance, men need to show girls and women they are welcome and wanted in the STEM workforce. The role I felt where I could help most for the event was leading the STEM activity committee. 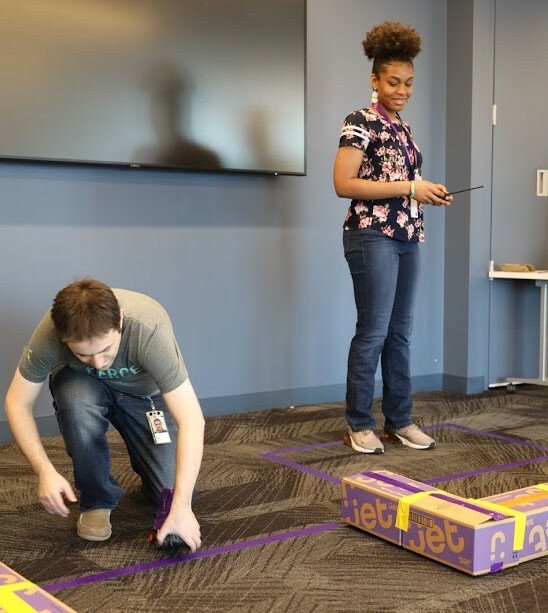 Our goal was to come up with a fun, interactive STEM activity that tied back to the challenges we tackle here at Jet.com and Walmart. (Check out some of my other articles on the Jet blog, and you’ll see that I love building interactive learning activities). While brainstorming our plan, we faced several constraints and challenges. First, girls attending our event ranged from sixth-graders to high school seniors. Second, we had to fit the entire activity from explanation to execution into a 45-minute time slot. Third, we didn’t want to do something where the girls would just assemble some kit that demonstrated some scientific principle. And lastly, while it is Girls Who Code, we wanted to do something different from writing an app or programming a robot. Something off-the-shelf wasn’t going to cut it for us. We started thinking about some of the problems we solve here at Jet — inventory management, pricing optimization, and efficient delivery, to name a few. How could we fit something into 45 minutes? Thinking about some of my favorite STEM activities, I remembered the crash car challenge from a junior high drafting class (a variation of something like this). It was then that it became clear to me how we could connect this back to Jet, where we are working to build the best grocery delivery experience! You know what no one likes? Crushed produce, spilled liquids, and broken jars in their grocery delivery. We decided to take the crash car to the next level. After some planning sessions, we expanded on the idea of keeping an egg (representing a delicate delivery) safe while also dealing with decision-making and risk-taking. 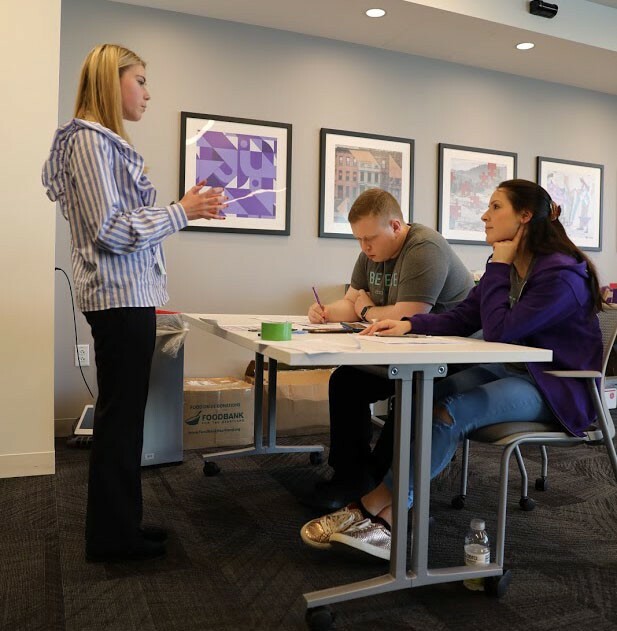 We wanted to keep the solution fairly open and flexible to empower the girls to experience the type of decision making that engineers and operations managers contend with on a day-to-day basis. Many STEM projects are presented in a vacuum in order to demonstrate underlying scientific principles. In the real world, businesses need to consider different options and make hard decisions with limited data. Additionally, real engineering tasks often need to balance risk trade-offs in order to maximize profits. As we refined our idea, we really liked that we were adding aspects of management and decision-making into the mix. We wanted to inspire the girls to be leaders, critical thinkers, and decision makers. The mission: Safely deliver an egg using a remote-controlled car through our treacherous obstacle course. Along the way, the girls needed to plan their route to either conquer obstacles on the shorter path or take the longer path to avoid them. They also had to make choices to minimize the cost of their delivery, as well as balance risks and maximize profits. We divided the girls and grouped into teams of four to six people. Each team was given the opportunity to inspect the RC car obstacle course to understand the different route options — should they risk their egg in the jump or take the longer path around? Next, each team was assigned a $100 budget. Their first spending choice was their car — Did they want to save money with the smaller car, or shell out for a faster, bigger car? Next, the teams decided how much to spend on securing their eggs. They had to think about what size box to use as a carrier and what materials to spend on to insulate and protect their delivery. Their final decision was whether or not to buy “insurance.” They could pay a lesser fee upfront to have the ability to stop the timer and run onto the track to fix their car if needed. If they chose not to buy the insurance, they had to pay a higher price for an emergency stop if needed later. The more a team spent up front, the more they limited their potential profit. However, smart spending allowed them to take on obstacles and deliver their egg faster and safer. And time was money! Every dollar teams didn’t spend allowed them to subtract 0.5 seconds from their total time. For example, if they spend $60 out of $100, the $40 they saved reduced their delivery time by 20 seconds. In addition, the girls needed to deliver their egg safely: A damaged egg added 15 seconds to their time, and a completely cracked egg added 30 seconds! The best time after penalties and with bonuses wins. Driver: Operated the RC car during the time trial. Treasurer: Managed the team’s budget and expenses. Time Keeper: Ensured the team was progressing and managing their time during planning and building. Lead Engineer: Mediated discussions and helped the team strategize and assemble their car. Each team was given 1- minutes to review the obstacle course and come up with an initial strategy. They then got 5minutes to “go shopping.” Afterward, 15 minutes was allotted to assemble their cars. Finally, each team was given a maximum of 2 minutes to complete the obstacle course. The STEM activity turned out to be a lot of fun for the girls and our team of volunteers. We actually spent over 150 people hours planning, coordinating, and building the course (Big thanks again to the whole team for helping to pull this off!). It was really great to see so many Purple People taking time out of their busy day to support this activity and make it a success, but it’s par for the course in Jet’s DNA. We all had a lot of fun, and it felt great when so many of the girls came up to us at the end of the day and thanked us for putting on the event. We packed a lot of decision-making into a very short period of time, but all the teams did a really great job. There were a few risk takers, but no broken eggs! We saw a lot of teamwork and creative thinking. Many teams smartly opted to pre-purchase insurance, but a few teams sped through the course like RC pros. In fact, our winning team managed to get a negative total time — they spent little and went fast! The biggest surprise of the day was the team that chose the fast-but-hard-to-control flip car. It turned out that with sufficient packaging, they were able to keep their egg secure and get their car off its side using smart driving and no insurance. Sometimes, a big risk pays off! We hope that this project inspires you to build fun STEM activities and to start similar initiatives at your company. We will work to make a copy of the activity packet and worksheets available for other groups to run similar events in the near future. If you have any questions, let us know in the comments below. Do you want to work on fun real-world challenges? Do you want to work in an inclusive workplace that promotes diversity and equality? Check out our careers page for awesome opportunities and upcoming internships at Jet and Walmart. First — Check out Part I! Then — Get some more in Part II! Looking for more resources to help girls find great STEM learning opportunities?